The Macquarie Credit Union Dream Festival is a community festival that embraces many facets of the arts to celebrate the communities’ creativity. Each festival brings a series of entertainment, theatre, dance, visual arts, music and outdoor events from local and professional groups and artists. Each year the Macquarie Credit Union staff volunteer their Saturday afternoon/night for the festival’s Music & Markets in Victoria Park and are kept very busy selling glow products on behalf of the Dream committee whilst handing out over 1000 balloons on the night. 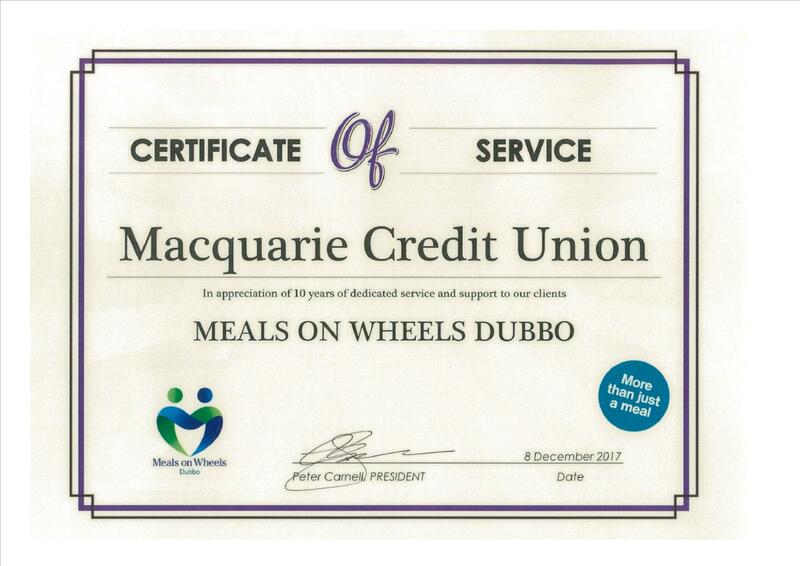 For over 10 years Macquarie Credit Union has proudly volunteered their time to help deliver meals to members of the community. October saw Macquarie Credit Union tickled pink. We threw our efforts into supporting the McGrath Foundation. This is a cause close to many of our staff’s hearts and we were so proud to raise over $500 and to be a part of such a wonderful organistation. Each Friday Macquarie Credit Union staff has casual days wearing jeans. Doing so each staff member pays $2. Over the last 4 years staff have raised over $4500 to help support local charities and events. Friday 9 November the Credit Union held its first Cocktail party at Bellotti’s Italian Dining. It was a fantastic night and was great to see so many new faces. The night was made that little bit extra special with Chris Shepherd being presented with a plaque celebrating his 31 years as Chairman of Macquarie Credit Union, Chris has served on the board since 1971, although he stepped down as chairman November 2017 he still remains on the board of the directors. Well Done Chris on such an historical achievement.